All prices exclude delivery. Due to the nature of the goods and their size they have to be delivered by a specialised truck and rigging crew. Hence delivery is charged extra based on the distance and complexity of the delivery. Do I need anything else to connect the generator? Yes, you'll need either an Automatic (ATS) or Manual change over switch in order to link the generator into your properties electrical distribution board. The warranty is 12 Months or 1000 Hours whichever occurs first. It is a limited warranty. Travel to site is not included in the warranty. The goods need to be returned to us or a call out will be charged. Please refer to the Terms and Conditions of sale and the Warranty Card for further information on the warranty. Warranty is held with the agency where you bought the generator. 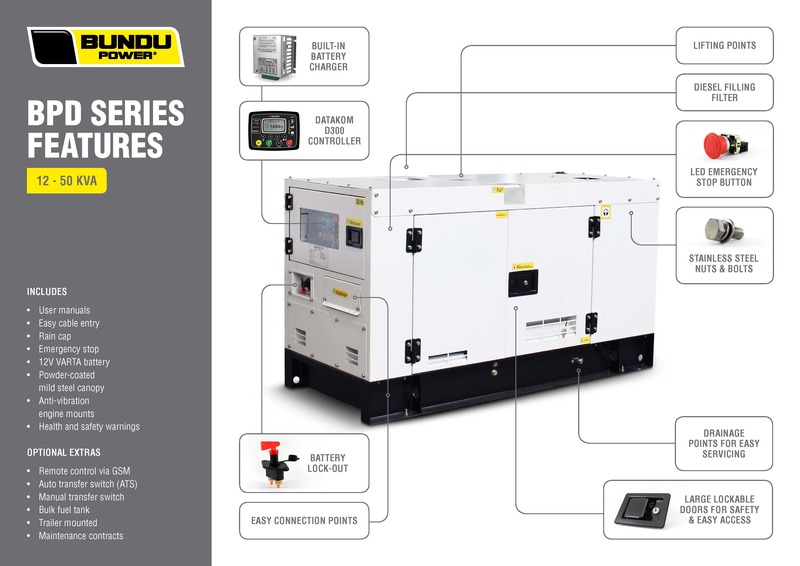 If you have purchased your generator in Johannesburg then the warranty is held in Johannesburg etc. PLEASE NOTE: ALL ratings are approximate and at SEA LEVEL. Engines need to be de-rated for altitude. A rough guide to de-rate performance is 1% for every 100m above sea level. I.e: A 20kVA at sea level is an 18kVA at 1000m above sea level (10% less) etc. The generator will not be able to take the full load instantaneously. The load should be added to the generator gradually. 50% initially and then stepped up over time once engine is up to temperature.